BASC warmly welcomes Keir Edgar who has recently joined the BASC and FIRST teams from Carnegie. 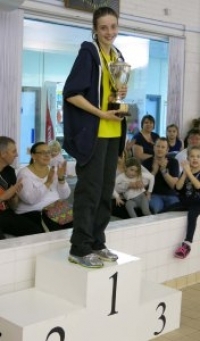 Keir has been swimming competitively for a few years now and has been having a very successful season within his current age group (13/14 years). The first competitive event of 2016 for BASC swimmers was held over the weekend of Sat 9th & Sun 10th Jan with a FIRST Open Meet at the Bathgate Xcite pool. A total of 13 BASC swimmers attended; 4 of whom swim for FIRST, and the other 9 having been invited from BASC Gold and Silver squads. A total of 24 BASC swimmers attended the LDD Development Meet at the Xcite Centre, Whitburn on Sunday 17th January. This was Improvers and Bronze squads first meet since the New Year, and some of the younger swimmers from Developers had also been invited. Former BASC swimmer Duncan Scott wins the Sunday Mail Young Sports Personality of the Year! Congratulations to a former BASC swimmer Duncan Scott who was voted Sunday Mail Young Sports Personality of the Year. Duncan won the award at the Sunday Mail SportScotland Scottish Sports Awards 2015 ceremony on December 3rd at the Glasgow City Hotel – the annual ceremony honours the best of Scottish sport. The BASC Annual Club Champs are just a few weeks away and provides a great opportunity for everyone involved in the club; swimmers, coaches and chauffeurs – to get together, celebrate another year of swimming and have some fun. Ellen Kilgour attends Scottish Swimming Youth Leaders Development weekend representing BASC. BASC’s very own Ellen Kilgour recently took part in a Scottish Swimming Youth Leaders event weekend in Dunoon. Ellen was representing BASC amoungst other youth leaders from clubs all over the West of Scotland. This was a great experience for Ellen to be involved in and also helps to raise the clubs profile. Niamh Tierney wins BASC Swimmer of the Year at Club Championships award ceremony. Niamh Tierney was awarded the BASC Swimmer of the Year and presented with the Sreenan Trophy in recognition of her dedication to swimming and overall performance over the year. Three BASC swimmers attended the DCA Autumn Open Meet at the Olympia in Dundee representing FIRST. Another good show for BASC at the Alloa Graded Meet over the weekend of the 24th & 25th October at The Peak Sports Village in Stirling.